Staring into the abyss that is the modern job market can be paralyzing. As soon as you have stepped off that graduation stage and moved your tassel to the appropriate side, you may find an overwhelming anxiety starting to brew in your stomach. Whether you graduated from Northwestern University or Northeastern University, it will be a struggle to find your first career-worthy job. The amount of expected qualifications for entry-level jobs is higher than ever, the jobs are fewer, and the competition is greater. While a bachelor’s degree was never a guarantee of a job, these days, it isn’t even close. But there is no reason to get discouraged, even if things seem bleak. You are a college graduate, a huge step towards having a chance at finding a job and career you love that will provide for you and your potential family down the line. It won’t be easy, but nothing in life is. And everybody gets a job eventually if they stick with it. So just don’t get discouraged, and follow this important career advice for college grads. Now that you are out of college, a two things have become true about your reality. You no longer have anything to do everyday, and your student loan countdown has begun. After spending four years busier than you have ever been with your social life, class load, internships, and extracurricular activities, your days are now empty. And since you’ve graduated, you now have six months or less until you owe a big chunk of change monthly towards paying off your student loans. For both of these reasons, you are no longer allowed to have standards for the type of jobs you apply for. You have all day long to apply to every place that will take your application, and you desperately need one of them to accept you so you can have a chance at paying off your loans. No more worrying about a dream job or even your chosen field, now it is time to focus on money. 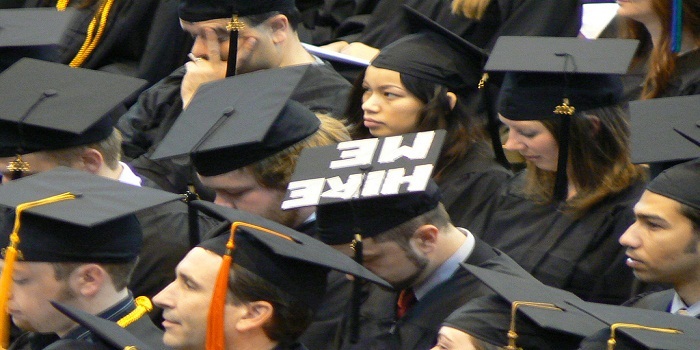 Most people remember the time right after they graduated college less than fondly. It is scary, intimidating, and a little bit lonely. You will probably get rejected or ignored by more than one job before you finally get one. But you will get one! Always remind yourself of that in the dark times, and keep your head above water. If you stay diligent, things will eventually fall in your favor. Moving back in with your parents involves sucking up your pride, giving up some freedom, and possibly risking your sanity. But it is the obvious choice for anyone who has the opportunity. Mainly because it also means you don’t have to pay rent. It buys you time and security, and gives you an emotional support system in a hard time(hopefully). If you don’t have to worry about rent payments, that six-month grace period will be even easier on your bank account.